I nearly hyperventilated and called the number in the ad. There actually was already someone coming to get the dresser, but they decided to set an appointment later that afternoon. Hah! Guess they aren’t familiar with the crazy people like me on Craigslist. I may or may not have been encouraging my husband to speed the entire way there. Well, let’s be honest, I definitely was. 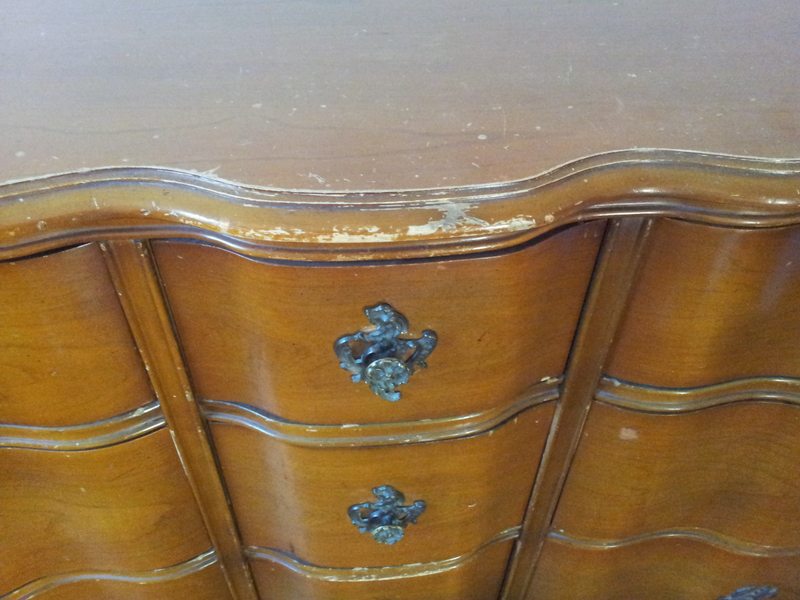 The dresser was even better than I expected – all solid wood, the drawers in perfect condition. The finish definitely had plenty of wear, but no serious damage. The husband helped me load the last drawers, just as another would-be Craigslist buyer was pulling into the driveway. This is Craigslist, people… minutes matter! 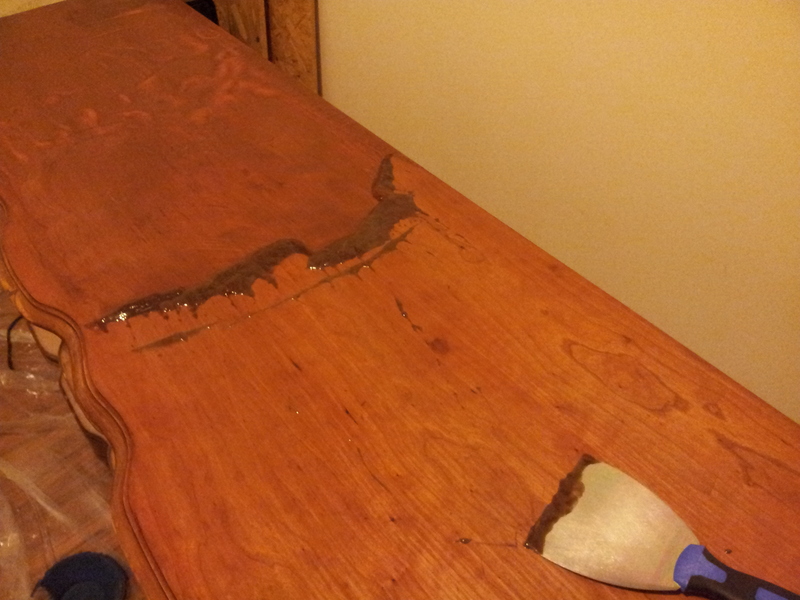 I was a little nervous, since this was my first attempt at stripping and staining wood (I hadn’t yet refinished my dining table). However, I did my research, and I think it turned out great. It was a more forgiving process than I imagined. I also highly recommend Citristrip for your stripper, especially if you’re insane like me and you want to refinish furniture in a very small office in July with only a window unit for air conditioning. This is where you can see just how crazy I am. Left: No Wax. 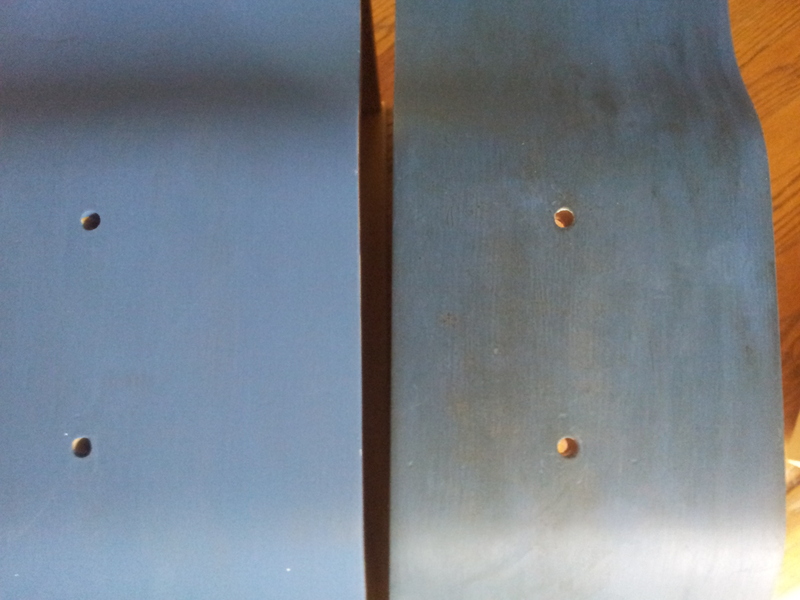 Right: Dark Wax. Wax on, baby. 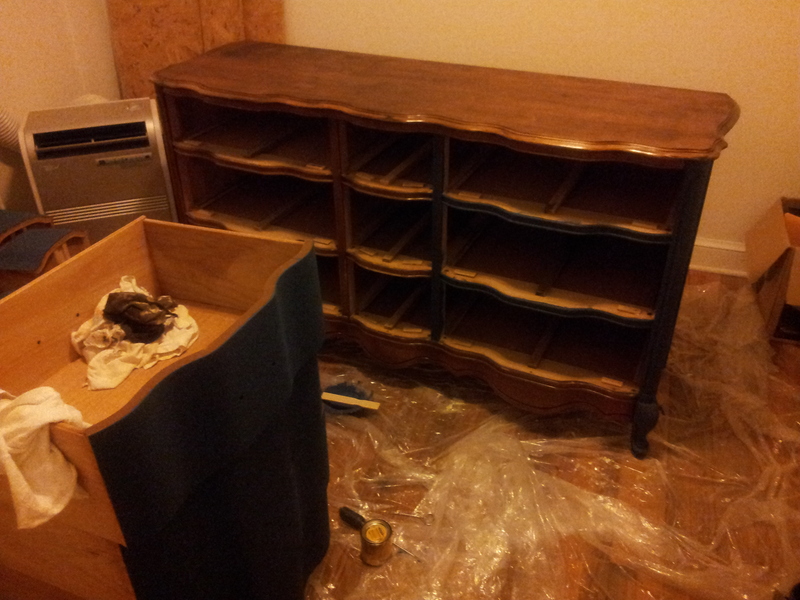 I stained the top with Minwax Dark Walnut, and finished it with three coats of polyurethane. I think it looks so amazing now… it really is my favorite piece of furniture in the house! Affectionately named Big Blue. She is a thing of beauty. Anyone have their most favorite piece of furniture to share? I don’t have any nice furniture….hence why I live vicariously through your blog. Beautiful job!!! Noticed your cork letter..DIY? Do you have any idea what font you used for your letter? 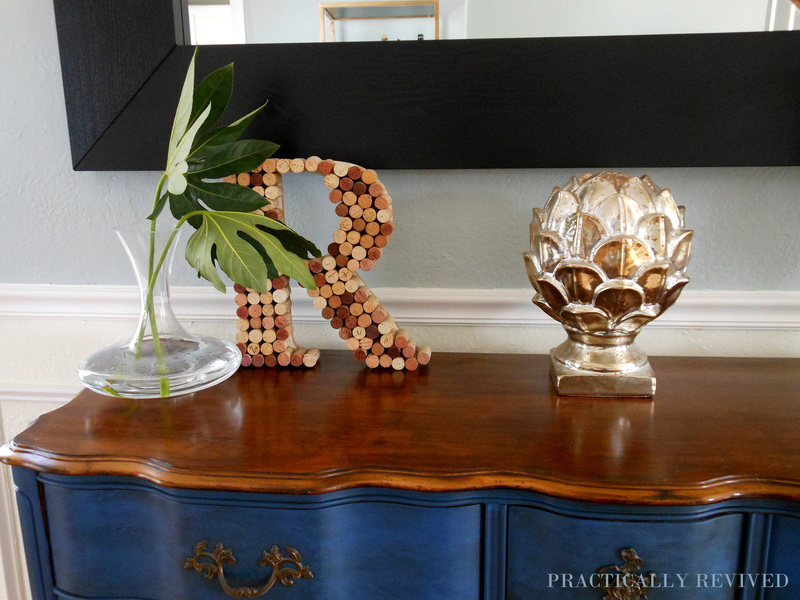 I plan to make the same “R.” And I’m wowed by the dresser. This could be my new hobby. I checked the font, and I used the good ol’ standby: Times New Roman in Bold. I’m sure your cork “R” will turn out great. 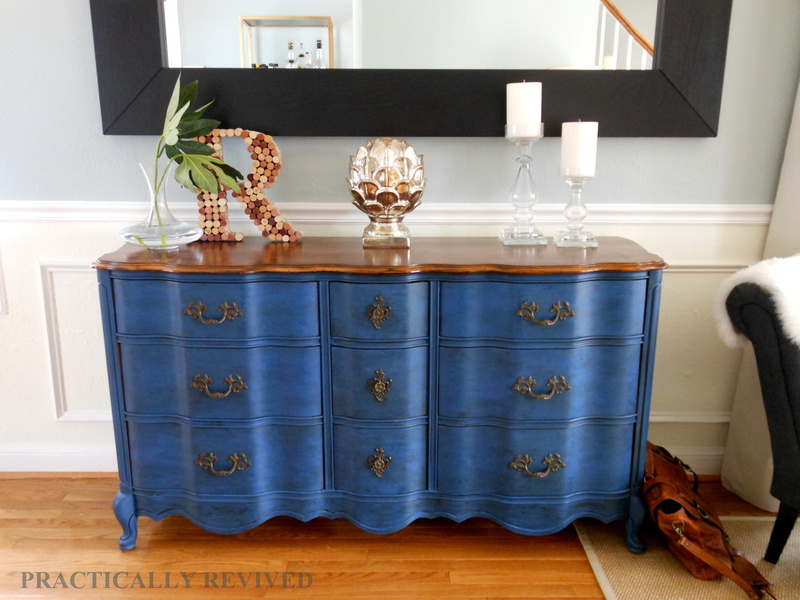 I’m so glad you like the dresser and found some inspiration! My jaw literally dropped when I saw the After photo. So beautiful! Both the hubs and I said – “it’s a corker!” That means top job in Maclean-speak!!! Ha! I love it! Thanks so much! Wow oh wow you did an amazing job! I love the blue with the dark wax, and the top came out perfect. What a find! Clearly a jewel of a find, it is a quality piece! Usually, I would say restore to original state, but this look is stunning! 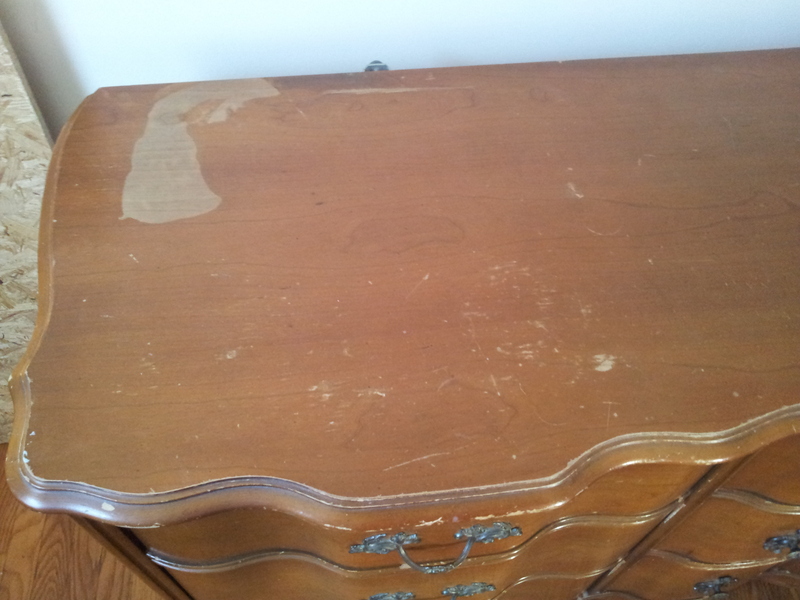 Thinking of of trying ‘homemade’ chalk paint on an old ‘cheap’ dresser. How do you use the wax to give it the timeless look? Thanks Elaine, I’m glad you love it as much as I do! I used Annie Sloan clear and dark wax to achieve this look. Basically, I worked in small sections, applying the clear wax first. While the clear was still wet, I blended in a very small amount of the dark wax. I just used pieces of old t – shirt to apply it. You can easily control the amount of dark wax with the clear, either wiping the dark off completely, or to tone the dark down a bit. I hope that helps- and I would love to see your dresser when you’re finished! Wow, thank you so much Christina! I appreciate the recognition, and I’m looking forward to answering the questions. What a great way to get to know some new blogs! I have this same exact dresser, also bought on Craigslist! I paid $90.00 and it is in perfect condition. I’ve struggled with wanting to paint it but not wanting to because of condition being in great shape I somehow felt I would be violation the dresser! I know weird. Seeing this had defiantly convinced me, I’m painting it and will stain the top, getting the best of both worlds. Thank you so much for sharing. It’s beautiful. Can I ask how much of the Annie Sloan paint it took? One should always proof read! Sorry for the two blunders the “had defiantly” should be has definitely”…note to self don’t post when tired! Thanks Marilyn! I’m glad seeing the dresser gave you the courage to go ahead and paint yours. 🙂 I would love to see it when it is finished! I’m not sure of the exact amount of paint, but it was much less than a quart. The AS paint has good coverage. This comment is late but very much on-time for my project. 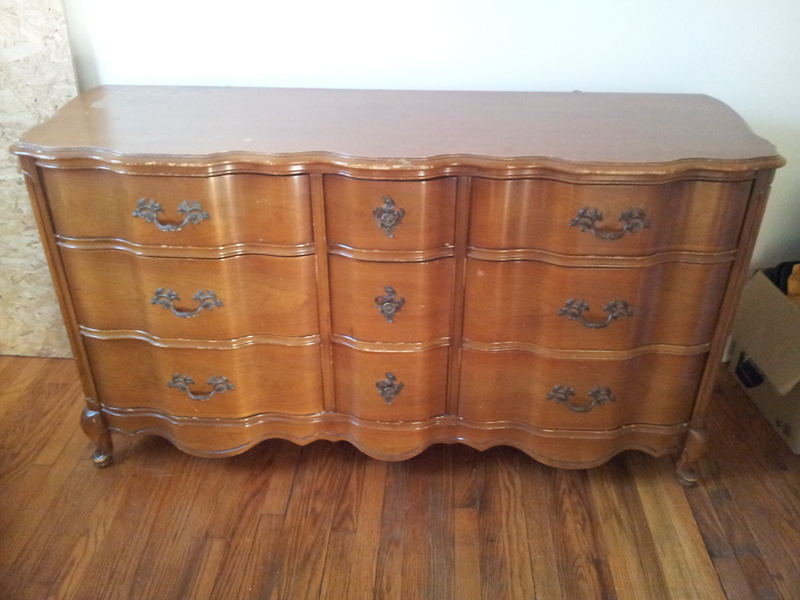 I just purchased a Martinsville dresser and nightstand from a friend and both are in fantastic condition. I was nervous to refinish it because it’s truly an antique in great condition and I didn’t want my paint job to cheapen it. However your post has inspired me and I’m motivated to refinishing both pieces with my personal style (purple instead of your blue). I had not thought of staining the top but I now may consider that. Thanks for sharing the products you used! I’m excited! The color blue with the dark wax is GORGEOUS! I just found a cute antique sitting bench on Craigslist for $30….and it would look awesome with that color! Thanks for the inspiration! GREAT JOB! Laura! I am such a fan! Wow… you have totally inspired me. Thanks for being creative and sharing your work. I LOVE making ruined things beautiful again and you, missy, are a pro. Keep up the good work- I can’t wait to see more. Wow, thanks so much! I’m so glad you found some inspiration, I love hearing from other people who appreciate reclaiming/reinventing things that would be otherwise tossed. Thanks for stopping by! Did you have to strip all the dresser, as in sides,drawers,etc? Nope! That’s what’s great about chalk paint. I just made sure the sides and drawers were clean and dry before painting. I only stripped the top so I could stain it. I purchased that same dresser on a community group site. Sadly I didn’t get the bargains you did. Paid $300 for mine. But I had been looking for it for a year. Going to use as a vanity in our master bath. Painting it black with distressed nickel hardware. Plan to put a vessel sink on top. Wow, that sounds like it will turn out beautifully! I’d love to see pictures when you’re finished. Late, but did you ever post the finished product! I’d love to see the black and the hardware. I look at your dresser on a regular basis. It was beautiful and elegant even in its poor shape. You made it simply stunning. Brilliant work and inspiring!